I must say, one of the things that keeps me young (in spirit, of course) is the constant beauty attacks I experience at work while looking at art from all over the world and every conceivable time period. These beauty attacks occur pretty much on a daily basis. I’m sure my co-workers get tired of hearing me exclaim “That’s gorgeous!” about one artwork another. Sometimes these attacks are great in the extreme and become epiphanies. That means I’ve learned something new and I’m thinking about an artist in a brand-new light. That would be the case with Henry Bacon (1839–1912). Can you totally feel a sigh of relief standing in the shade rather than the bright sunlight? Bacon’s watercolors so remind me of the work of Sargent, particularly his scenes of Egypt and the Middle East. And he totally learned the Impressionist mantra to “not use black to make shades for shadows!” You can see that in his swipes of phthalo blue all over the place. This former Civil War (1860–1864) soldier and illustrator for “Leslie’s Weekly,” born in the state in which I currently live, went to Paris in 1864 to study art after being wounded in the war. Unfortunately, he chose the École des Beaux-Arts—instead of the Barbizon and their budding Impressionist protégés—and studied under the realist Alexandre Cabanel (1823–1889). He also came under the influence of the equally-vapid classicist realist Jean Léon Gérôme (1824–1904). The only difference in Bacon’s work of the 1870s and 1880s from those artists is that he painted many genre scenes of people in Brittany. Bacon developed an abiding love for the people and light of Egypt after his first trip there in 1897. By the mid-1890s, he had already swayed away from his genre scenes of middle-class French people in favor of Impressionism. 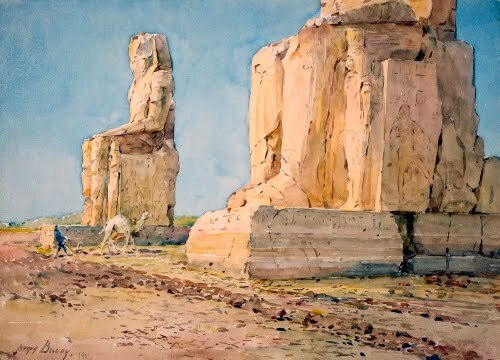 The light of Egypt confirmed his interest in observed light and painting on the spot with a lighter palette. 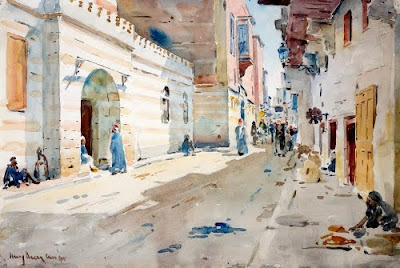 It also confirmed his love of watercolor, in which he worked almost exclusively for the rest of his life. Like Americans Winslow Homer (1836–1910) and John Singer Sargent (1856–1925), Bacon used the white of the paper as his highlight. He abandoned the opaque underpainting watercolorists had traditionally used. Here, again, we see the use of phthalo blue in the deepest shadows. Being an extremely poor watercolor artist myself, I’m always very envious of artists who can achieve such wonderful nuances with the medium. This lovely dusky scene is just full of the Impressionist palette, right down to the salmon and green he used for the foreground, which is beautifully complimented in the darkening sky. What most intrigues me is the smoke from the fire. 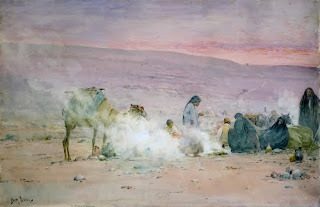 The lazy me is tempted to attribute it to white gouache he may have added after the rest was dry, simply because there is a big white blob in the middle of the smoke under the camel’s head. And how else did he achieve the wisps of smoke to the left, but with thinned, white gouache? Just gorgeous! And, just so you can compare his exciting watercolors to his…competent…earlier genre paintings, here is one of his oil paintings from the 1870s. 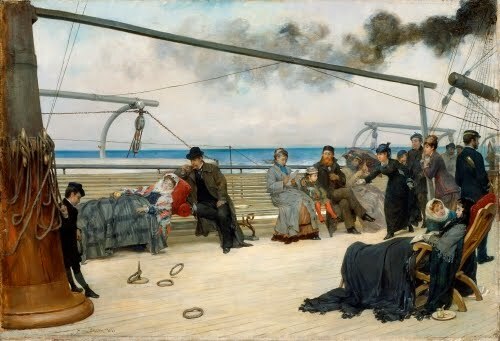 This subject is what made him famous: people on transatlantic steamers, the latest thing in the 1800s. Bacon did countless works on the subject of transatlantic voyages to America, a new craze in the 1800s since steamships made travel to the US much faster. I find this type of realism at a time when Impressionism was blooming a big YAWN. And speaking of big yawns, if Bacon’s realist period reminds you of anybody, here’s a hint: James Tissot (1836–1902). 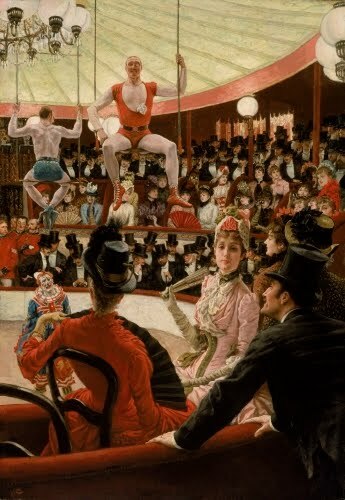 I can’t believe any art historian would ever even remotely associate Tissot with Impressionism, except that he liked to document middle class urban life. I’m not even going to guess what the dude on the trapeze with a monocle means!